This week on earth, a major decision was reached regarding future transportation options to the International Space Station. In a significant development for manned spaceflight, aerospace companies Boeing and SpaceX were chosen by NASA to supply the spacecrafts that will ferry US astronauts to the ISS after 2017. According to theverge.com, the two companies will split $6.8 billion dollars ($4.2 billion to Boeing, $2.4 billion to SpaceX) over the next three years to bring their manned-spacecraft certification plans to fruition. 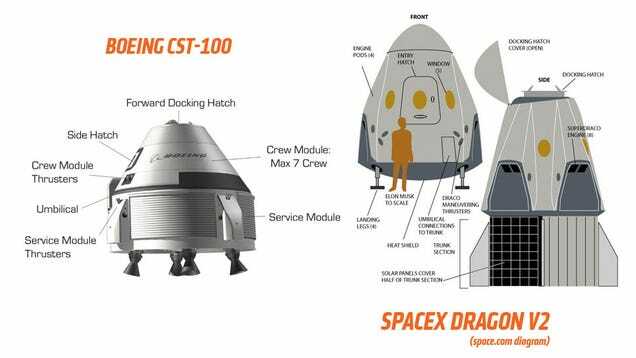 Boeing's CT-100 capsule will be developed along with SpaceX's Dragon V2 craft, and both will be rigorously tested by NASA (including a mission with just one astronaut) before becoming the ISS's personal limo service. Currently, American astronauts hitch rides in the Russian-made Soyuz capsules launched from Kazahkstan. At a cost of $424 million, NASA's contract stipulates six space seats on the Soyuz until 2017, however this deal has grown more tenuous as Russian geopolitics have entered the fray. Boeing and SpaceX have proudly stepped up to the challenge to help make America an independent space power again, a laurel we lost with the demise of the space shuttle program in 2011. As reported by Forbes.com, the new spacecrafts will have a capacity for up to seven astronauts, plus payload. The Boeing CT-100 will be launched by Atlas V rockets, which are a product of United Launch Alliance (a collaboration of Boeing and Lockheed.) The SpaceX Dragon will be launched via the company's own Falcon 9 rockets. Once certified, the spacecrafts will each serve at least two (but possibly up to six) missions apiece. “This will enable NASA and its international partners to perform more research on the international laboratory, nearly doubling its research potential,” NASA's Commercial Crew Program Manager Kathy Lueders said. The spacecrafts will be very durable, with the emergency option of acting as a "lifeboat" for up to 210 days, if needed. Your new travel options to the stars. Aboard the ISS, practice has already begun for the rendezvous of an unmanned SpaceX Dragon supply capsule, which is slated to arrive at the ISS on Tuesday. The capsule will be "grabbed" by the ISS's exterior arm-like mechanical appendage, the Canadarm. One particularly fascinating bit of technology aboard the SpaceX is a 3D printer from the "Made In Space" company, which is the first printer of its kind to ever go into orbit. The ISS astronauts will test the printer in hopes of possibly gaining the ability to print tools and small spacecraft parts that wouldn't require a whole launch mission to bring them up...even though soon, there'll hopefully be a lot more of those. “The work that we have underway…is making the possibility for everyone to someday see our planet Earth from space,” Kennedy Space Center director and former astronaut Bob Cabana told reuters.com. "I know a lot of us are cheering on the success of our Commercial Crew program, not because of what it means to NASA…but what it means to human spaceflight for everyone." That's right, astro-pioneers...this may help advance your chance to someday slip the surly bonds of Planet Earth. Until then, watch this space!